So you received a wedding invitation in the mail and your first thought is "What do I wear?". If your like me, you may not want to go out and buy anything new because you don't have the occasion to dress up very often and therefore will not get much use of it. 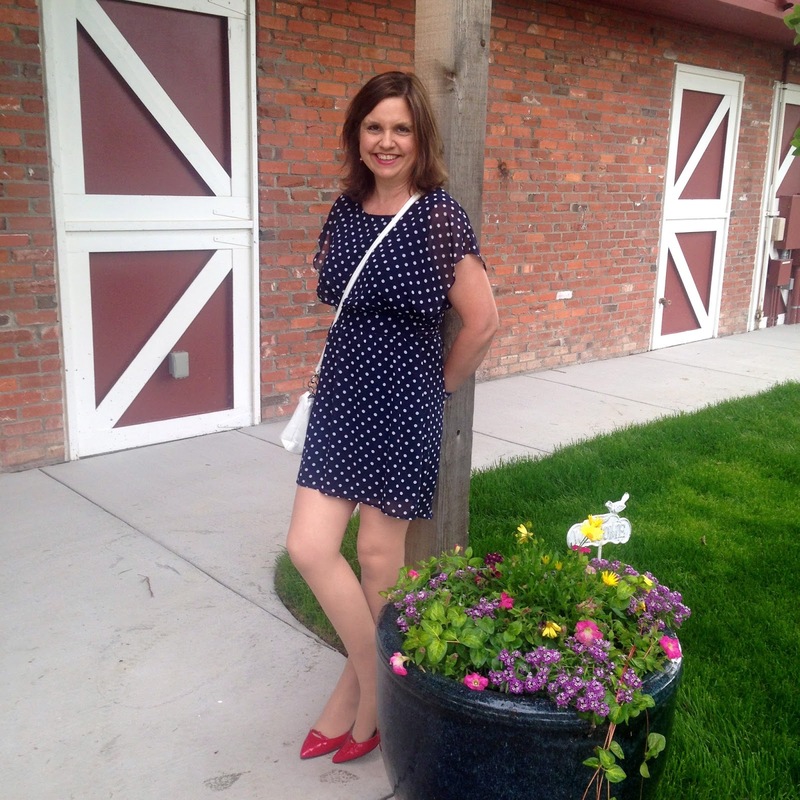 Since my lifestyle is pretty casual, I only have a small handful of dresses hanging in my closet, and this navy, polka dotted dress from Francesca's was one of them. I've actually shown it to you before in THIS POST, so because it's a repeat item for you, I tried to style it just a bit differently. Since the wedding was outside in cooler temperatures, I had to wear a jacket. Originally I was just going to wear the dress with a large, white sun hat when I thought the temps would be warm and sunny. But I left the hat in the car when I saw the clouds roll in. Even though I saw several women at the wedding with beautiful garden hats on, for me a hat has to serve a purpose or I can't wear it. I either wear one to keep my head warm or cool, or I'm having a really bad hair day. But since neither was the case on this day, I wasn't comfortable wearing my hat and I just admired the hats of those who did. But don't fret, you will see my hat in future posts because the Colorado sun is quite intense and I did have to wear it several days on my trip to keep my face from getting burned. When choosing a garment for the wedding, I had to keep in mind a long travel period in the car. I needed something that was comfortable to wear (we had a four hour drive the morning of the wedding), and would not wrinkle. This dress certainly fit the bill! Unlike most dresses, this dress was super comfortable to wear. It has a solid navy blue attached sheath underneath, covered with a second layer of the sheer polka dot fabric. The waist is elastic, and as you can see in the photo below, the sheer material hangs over the arm too. It also has a high/low hemline: the dress is shorter in front and longer in back. 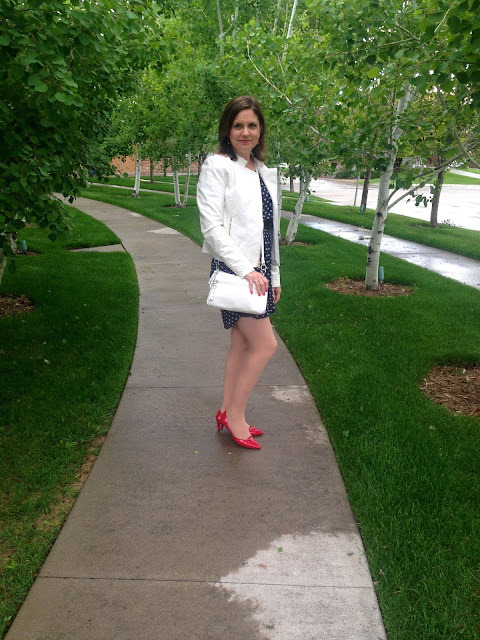 I broke fashion trends and pulled out a pair of nylons to wear on my legs….oh, no! Nylons! No one wears nylons anymore! :) The reason I did that was purely to keep my legs warm. I was worried that the temperatures would be too cool and I would freeze if I didn't. I was glad I did, because I felt quite comfortable for the entire wedding. And now for some close ups so you can see some details. I just zoomed in on some of the photos, so sorry for the graininess of the pictures. When my husband and I were taking these pictures, we weren't thinking of fashion photos and forgot to take close ups. For jewelry, I wore red and silver drop earrings that a friend from my old work place made for me and red and silver bracelets from Old Navy. My double strap watch is a souvenir I picked up at a gift shop from another vacation. 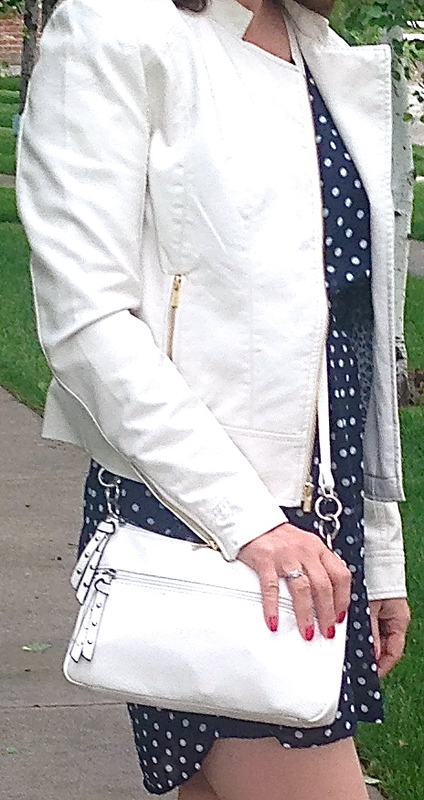 My jacket and purse my husband actually bought for me the day of the wedding. It wasn't a planned expense, we just had some time to kill before the wedding and we saw an outlet mall across the street from our hotel so we decided to walk around a bit. The jacket was on sale for only $34.00 and the purse was only $17.00. The store was Wilson's Leather. (It was a Memorial Day sale so they are not available that cheap anymore, but it is still a great price HERE. And you can buy the handbag HERE.) I had never been to that store before, even though I have heard of it. My husband dragged me in and I was very pleasantly surprised at what they had. I had planned on wearing my old trench coat before we saw this jacket, but this one went so much better with my outfit. And I really needed a solid white purse too. Although I already owned a white and black purse, I wanted just plain white in my collection as well. The cross body stye was an added plus, for it came in very handy for the rest of our vacation as well. My shoes are new too, but I bought them before the trip. I found them on clearance at DSW for about $12.00. I know, great score right? I've been looking for a pair of red dress shoes forever! They are by Kelly & Katie. 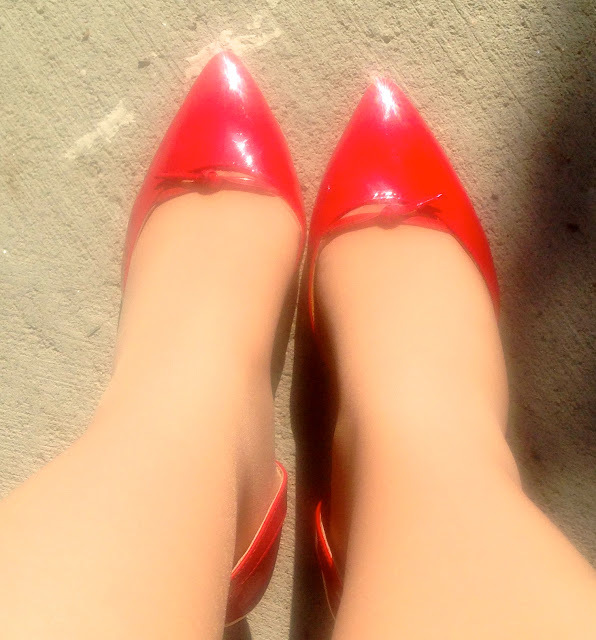 I usually don't buy pointy toe shoes because I find them so uncomfortable, but for $12.00, how could I resist? 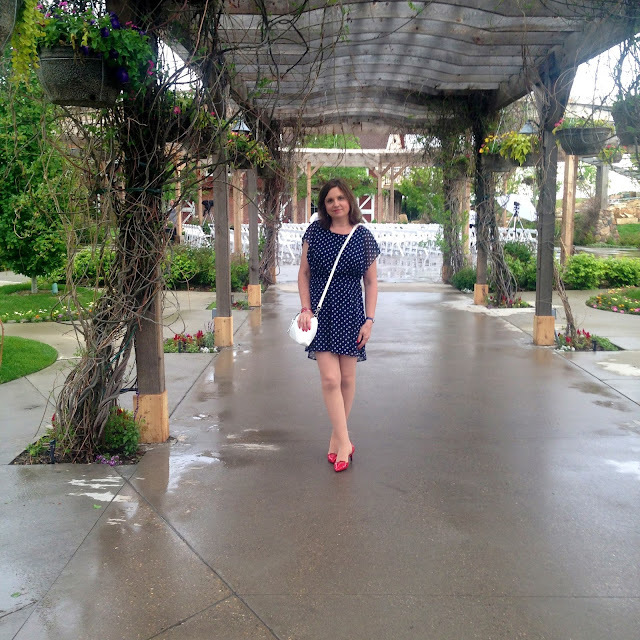 We had so much fun taking pictures on these beautiful grounds! 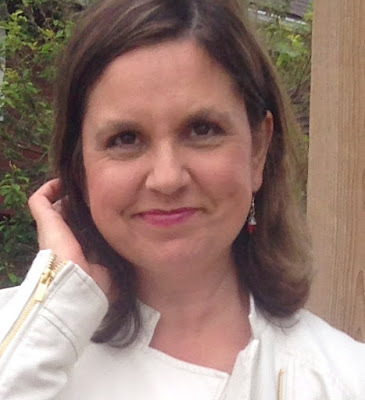 Linking Up With: Charming Friday, Fashion Should Be Fun, Favorite Fashion Friday, Friday Favorites, Casual Friday, and Passion For Fashion. Loving the way you styled this beautiful dress for the wedding. Very polished and nice Amy! Have a good weekend. Perfect outfit for a wedding-- very cute dress! Gorgeous look! Great idea for a garden wedding! Love the shoes! Thank you for linking up with Friday Favorites! Have a great weekend! Classy and beautiful! Thanks for sharing with Fun Fashion Friday & I hope you're having a fab weekend! Superb !! Love all ! blue and white polka dots are so classic! Reminds me of pretty woman. In Love with your dress, Amy!!! Looking so cute and stylish as always. Thanks so much for linking up with Charming Friday!